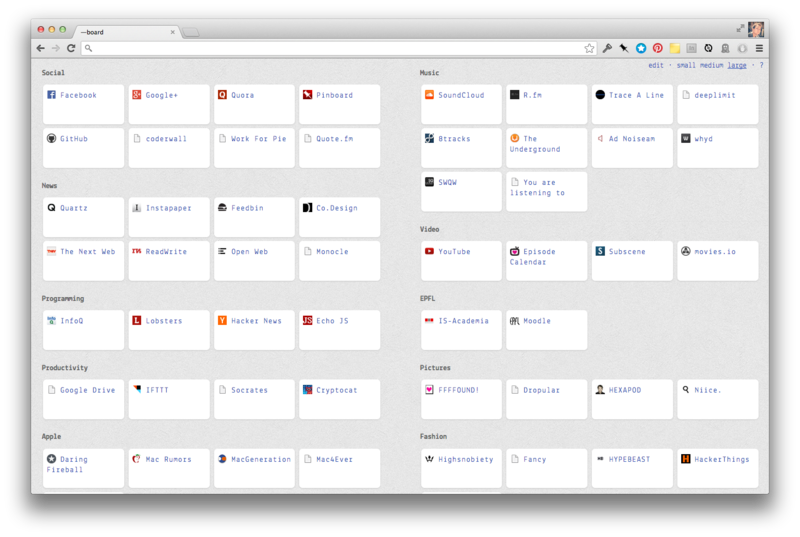 mdash is a Chrome extension which replaces the New Tab page with a light dashboard linked with your bookmarks. Click the big Install button above. Allow Chrome to download the .crx file by clicking Continue in the download bar. Click the Install button in the pop-up window. Once the extension is installed, just open a new window to activate it. You’ll now see an empty dashboard. 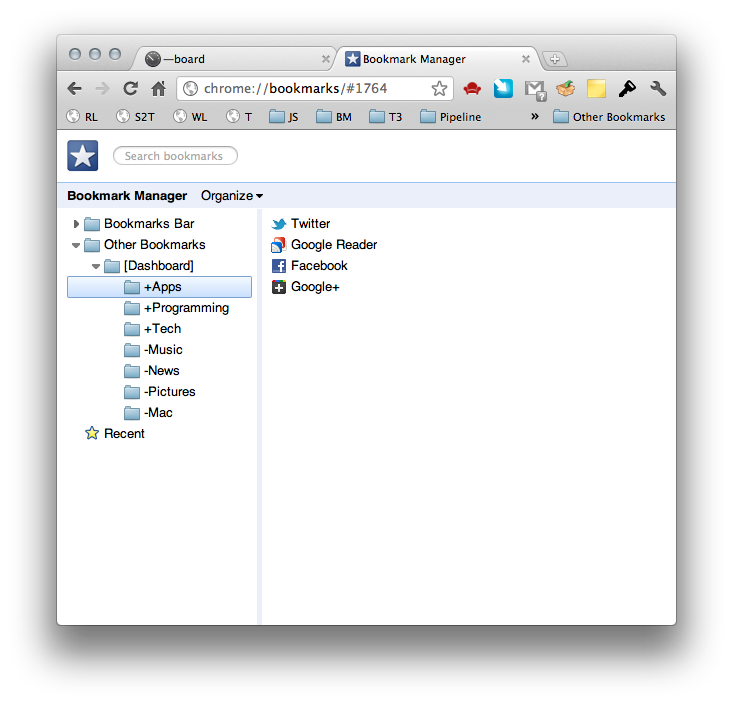 This is needed in order to enable to extension to create a special folder named [Dashboard] in the Other Bookmarks folder. Each section is represented by a folder. As it is currently not possible to attach metadata to a folder, it’s name will be used to determine in which columns the section should appear. Folders prefixed with the + character will be displayed on the left column, ones prefixed with a - will show on the right column. Browse any website you would like to add to the dashboard and click the star at the right of the address bar, then choose one of the previously created folders. Click on the edit link at the upper right of the dashboard (or just hold the Alt key), then click the big + button which will appear at the end of each section. 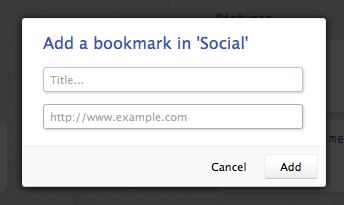 Give the bookmark a title and a URL (which must starts with // or any other schema), and click Add (or press Enter). When you're done adding bookmarks, click the done link at the upper right of the page. Click on the edit link at the upper right of the dashboard (or just hold the Alt key, after having cliked somewhere on the page to give it focus), then click on the bookmark you want to edit. In the dialog which will then open, make the needed modifications, then click Save (or press Enter). To remove the bookmark, click on Remove. When you're done editing your bookmarks, click done at the upper right of the page. If you have many bookmarks, it can become difficult to find the one you're looking for. Just click the document to give it focus, and then start typing (part of) the title of the bookmark you're looking for. This will filter the list of bookmarks to only keep the ones whose name contains what you've just typed. Press Backspace to erase the last character, or press either Shift+Backspace or Command-Backspace to clear the query and go back to the full dashboard. Add a section straight from the dashboard. Drag bookmarks around to re-order them or put them in another section. 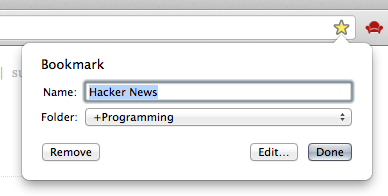 Version 0.9.0 - Implement bookmarks filtering (thanks Jack Weeden. Version 0.8.1 - Not a release but a mistake from my part. Version 0.8.0 - Not a release but a mistake from my part. Version 0.7.6 - Implement 'move bookmark to another section'. Version 0.7.7 - Add section selector to edit panel. Version 0.7.6 - Remove inline script because of the new Chrome Content Policy. 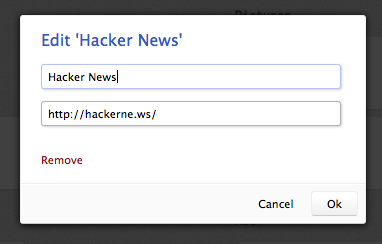 Version 0.7.5 - Fix upload to the Chrome Web Store. Version 0.7.4 - Update manifest to version 2. Version 0.7.3 - Fix a layout bug with Chrome Canary (21.0.1152.0). Version 0.7.2 - UX improvements. Version 0.7.0 - Add/edit/remove bookmarks straight from the dashboard. Version 0.6.3 - Fix a bug which caused the 'edit' mode to always stay on once activated. Brought to you with love by @P45C4L and @_romac. Beautiful icon made by @ntzog. mdash is licensed under the MIT license.